Dr. Bhavin C. Jariwala is a popular Ophthalmologist in Mahuva, Surat. 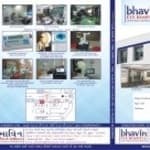 You can visit him at Bhavin Eye Hospital in Mahuva, Surat. Don’t wait in a queue, book an instant appointment online with Dr. Bhavin C. Jariwala on Lybrate.com. Lybrate.com has an excellent community of Ophthalmologists in India. You will find Ophthalmologists with more than 34 years of experience on Lybrate.com. You can find Ophthalmologists online in Surat and from across India. View the profile of medical specialists and their reviews from other patients to make an informed decision. Hi, I am suffering from retinal hemoraghes problem since 2007. I have undergone many lasers in both eyes including the intake of heavy dose of steroids. Now the situation is like some sort of vitreous is there like cobwebs floating 24*7 which is bothering me in both eyes. I want to know, Is there any other treatment to get rid of this like surgery or this vitreous is not removable at all. If surgery is the option, what are the risk involved in it?